PREP@UGA Scholars program trains next generation of life sciences researchers. As an undergraduate student in Maryland, Ian Liyayi planned to major in nursing but got lost on the campus tour and found himself in the biochemistry department. He liked that even better. When it came to preparing for graduate school, Liyayi didn’t want to get lost along the way, so he applied for the University of Georgia’s competitive PREP@UGA Scholars program to give him more experience before he began applying to doctoral programs. “This program gets you fully ready for grad school because you get a ton of time in the lab,” said Liyayi, a current scholar who said he enjoyed research experiences in his undergraduate years at Stevenson University but didn’t gain much hands-on laboratory experience on long-term projects. With funding from a National Institutes of Health grant, the PREP@UGA Scholars program was created five years ago. Earlier this year, co-directors Erin Dolan and Mark Tompkins received a $2.1 million, five-year grant renewal, which will continue to fund a cohort each year of six to eight scholars from underrepresented groups or with limited opportunities in the STEM fields at their undergraduate institution. To date, 32 students have participated in the program. About one in four later enrolled in a UGA doctoral program, with the remainder going on to graduate programs at other institutions. Programs such as PREP@UGA have helped make UGA the nation’s top public flagship university for the number of doctoral degrees it awards to African Americans. For Jilarie Santos Santiago, those mentors have helped her realize her potential in just her first few weeks on campus. 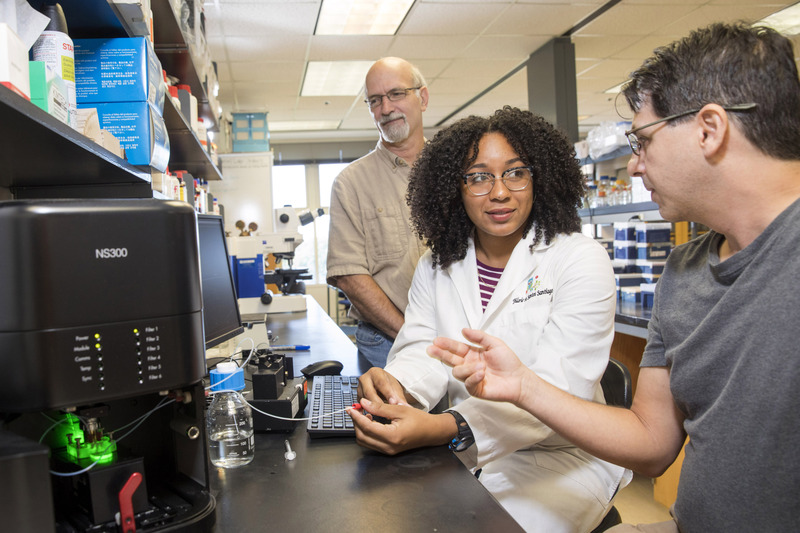 “I am stepping out of my comfort zone,” said the graduate of the University of Puerto Rico Humacao, who is currently conducting research in Stephen Hajduk’s lab. As an undergraduate, Santos Santiago worked on a project for several years to determine a way to thwart parasitic nematodes from destroying the plantain harvest on her home island, but she wanted to explore other areas of life sciences research and learn new techniques before beginning a doctoral program. She also wanted to improve her communication skills, and she’s excited to learn more about the process of publishing research articles. Tompkins, a professor of infectious diseases in the College of Veterinary Medicine, said his experience as a mentor for a PREP@UGA Scholar last year drove home the impact of the program on students, the research team and on academia as a whole. changed that while providing lessons in independent thinking and problem solving that have given her confidence going into her doctoral program.